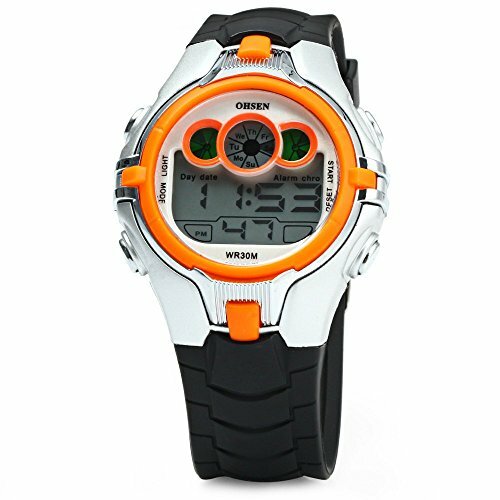 OHSEN Kids Sports Digital Watch Date Week Alarm Chronograph LED Lights by Yufeng Zhang at Watches Sales. MPN: AD0739. Hurry! Limited time offer. Offer valid only while supplies last. Function: Date, time, week, alarm clock, chronograph, backlight and 12 / 24 hours switch. LED lights, press the light button and not move, the lights color will change from blue, green, orange, red, purple and flash. Alarm clock, to remind you of every important moment. 30M water resistant, especially suitable for outdoor sports use. If you have any questions about this product by Yufeng Zhang, contact us by completing and submitting the form below. If you are looking for a specif part number, please include it with your message.